With minimal fanfare, Microsoft began rolling out Windows 10 Mobile as a free upgrade for older phones on Thursday, fulfilling a promise the company began making more than a year ago. 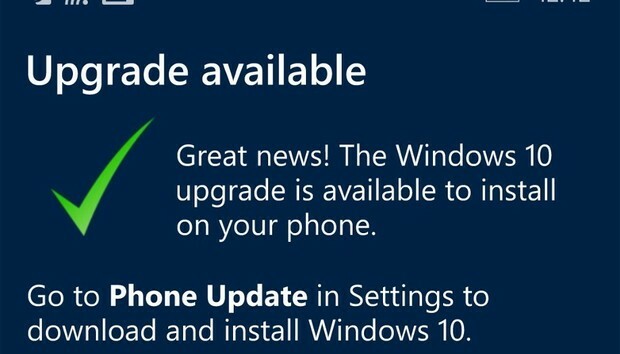 However, not every Lumia or third-party phone will be eligible for the upgrade from Windows Phone 8.1 to Windows 10 Mobile. There are 18 handsets on the list of supported phones, including the Lumia 1520, 930, 640, 640XL, 730, 735, 830, 532, 535, 540, 635 1GB, 636 1GB, 638 1GB, 430, and 435; plus third-party phones such as the BLU Win HD w510u, BLU Win HD LTE x150q, and the MCJ Madosma Q501. Last summer, Microsoft published a list of 10 Lumia phones that would be eligible for upgrades, all of which made the final cut. Noteworthy omissions include the beloved Lumia 1020 as well as the HTC One M8, Microsoft’s failed attempt at convincing third-party hardware makers to sell their own handsets powered by Windows Phone. Microsoft did not say whether it would be adding additional phones to the list. Why this matters: Microsoft just needed to get Windows 10 Mobile out to its customers, given the company's original promise that “broad availability of Windows 10 on other devices, including mobile phones, will begin rolling out in December”—and it’s now March. It’s a shame that some of the older devices aren't eligible for the upgrade, but it seems to be predicated on the availability of the Lumia Denim upgrade, anyway. Microsoft executives said some phones were excluded from the upgrade because of the risk of it resulting in a poor user experience. Users will apparently be able to manually request the update by downloading an Upgrade Advisor app from the Microsoft Store. At press time, PCWorld could not access the link, and the software did not appear to be discoverable from within the Microsoft Store app on a Windows Phone 8.1 phone. Microsoft did not address whether a Windows 10 Mobile upgrade will eventually become mandatory for Windows Phone 8.1 phones. It has tried to convince Windows 7 and Windows 8.1 desktop PC users to upgrade to Windows 10 through a number of different tactics, inciting an impassioned user backlash in the process.